Everett, Mass. – While they may not have provided the flash of the first two weeks, Everett still was the team celebrating after 44 minutes. Sophomore Duke Doherty threw for 224 yards and three touchdowns while the Crimson Tide defense made a late fourth quarter stand as No. 1 Everett held off No. 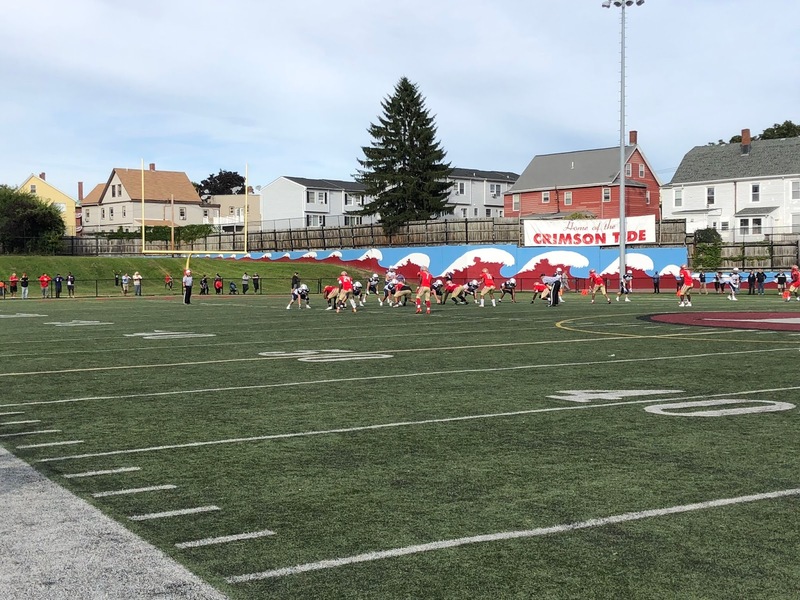 6 St. John’s Prep, 26-14, on Saturday afternoon at Everett Memorial Stadium. Everett (3-0) has now won 22 consecutive games and holds a 17-2-2 all-time record versus the Prep. St. John’s Prep (2-1) trailed 20-7 midway through the third quarter, but a James Hanley interception turned into a 15-yard touchdown pass from Matt Crowley to Anthony Fagan pulling the Eagles within six after three. The Eagles’ defense proceeded to force a quick three and out, giving the St. John’s Prep offense the ball back with 8:31 left and a chance to dethrone the two-time defending Div. 1 Super Bowl champions. Three rushes for freshman James Guy and three more for Aise Pream, coupled with a personal foul, moved the Eagles inside the Crimson Tide 35-yard line with two minutes left. As they have done throughout their storied run, the Everett defense refused to buckle. On fourth down and five, Crowley rolled right to evade pressure, but Chonlee Cine came flying in to break up the pass forcing a turnover on downs. Mike Sainristil then put the game out of reach, taking a hand off via an end around and going 66 yards down the near sideline for a touchdown to put Everett up 26-14. “Defense is our strength,” said Pierre. “I didn’t think our defense was great today, but like I said defense is the strength of our team. Our guys stepped up." In front of a full house for Everett homecoming, it was St. John’s Prep’s defense that made the standout fist impression. The Eagles intercepted a pair of Doherty passes on the first two series of the game, first by Pate Keefe at the goal line, and the second by Pream. St. John’s Prep offense, however, could do little with either turnovers, and by the time the middle of the first quarter arrived Doherty heated up. First, Doherty found Eli Auguste in stride for a 56-yard touchdown to give Everett a 7-0 lead. St. John’s Prep answered, going on a 14-play, 90-yard drive capped off by a one-yard touchdown run by Pream to tie the score, 7-7, at the start of the second quarter. Behind Doherty, the Crimson Tide extended their lead before the half. After a muffed punt gave Everett field position at the Prep 37, Doherty ran for 12 yards inside the red zone before hitting Isaac Seide in the flat for a seven-yard touchdown to put Everett up 14-7. Doherty continued his hot play on the Tide’s next possession going 3-for-3 on the drive capped off by an 11-yard touchdown pass to Tyrese Baptiste to give Everett a 20-7 lead at the break.